Grindel, a television journalist turned politician who three years ago was tasked with restoring faith in the reputation of Germany’s battered football leadership, stepped down with immediate effect following revelations about undeclared earnings and the receipt of a luxury watch 18 months ago from former Ukrainian FA boss Grigoriy Surkis. Grindel, a UEFA vice-president as well as one of Europe’s four FIFA Council representatives, was accused by German weekly magazine Der Spiegel last week of failing to declare additional income of €78,000 for being chairman of the federation’s subsidiary media management company in 2016 and 2017 – on top of his regular salary as DFB president. Then came revelations in another German paper about the watch. 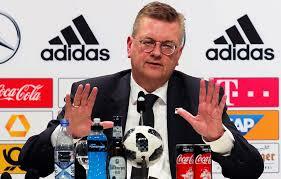 “Everyone who knows me knows that I am not greedy,” said Grindel, ironically head of UEFA’s compliance committee, who took over as head of the DFB from Wolfgang Niersbach, also forced to resign, in his case amid allegations of vote-rigging over Germany’s 2006 World Cup bid. Grindel oversaw a DFB-commissioned investigation in the affair but become increasingly unpopular as a result of a series of gaffes, not least the handling of Germany international Mesut Ozil’s controversial dealings with Turkish President Tayyip Erdogan prior to last year’s World Cup. Ozil, who has Turkish roots, retired from the national team after Germany’s shock first round World Cup exit lambasting the DFB for its alleged “racism and disrespect”. Earlier this year, Grindel took centre stage in helping Germany trounce their only opponent, Turkey, in a bid to host the 2024 Euros. In recent months he had become increasingly outspoken over the way FIFA was being run under the regime of Gianni Infantino. Grindel claimed Infantino was fuelling international prejudice against FIFA over his plans to reshape the landscape of world football without proper consultation. Yet now he has fallen victim to his own misdeamenours. Technically, Grindel, whose tenure as DFB president was the shortest in its 114-year history, can still retain his UEFA executive committee membership until his term ends but the position, along with his FIFA Council role, seems bound to become increasingly untenable. “I would like to emphasise once again, that I have no explanation as to why I did not ensure clarity with regard to the situation. You can believe me when I say that I’ve been in complete disbelief about my mistake since the weekend. DFB Vice presidents Dr. Rainer Koch and Dr. Reinhard Rauball are to head the German FA on an interim basis until September – for the second time having briefly done the same after Niersbach stepped down in November 2015.